BackgroundLong-term change in recovery-based practice in mental health rehabilitation is a research priority.MethodsWe used a qualitative case study analysis using a blend of traditional ‘framework’ analysis and ‘realist’ approaches to carry out an evaluation of a recovery-focused staff training intervention within three purposively selected mental health rehabilitation units. We maximised the validity of the data by triangulating multiple data sources.ResultsWe found that organisational culture and embedding of a change management programme in routine practice were reported as key influences in sustaining change in practice. The qualitative study generated 10 recommendations on how to achieve long-term change in practice including addressing pre-existing organisational issues and synergising concurrent change programmes.ConclusionsWe propose that a recovery-focused staff training intervention requires clear leadership and integration with any existing change management programmes to facilitate sustained improvements in routine practice. 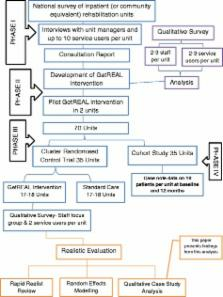 Conceptual framework for personal recovery in mental health: systematic review and narrative synthesis. No systematic review and narrative synthesis on personal recovery in mental illness has been undertaken. To synthesise published descriptions and models of personal recovery into an empirically based conceptual framework. Systematic review and modified narrative synthesis. Out of 5208 papers that were identified and 366 that were reviewed, a total of 97 papers were included in this review. The emergent conceptual framework consists of: (a) 13 characteristics of the recovery journey; (b) five recovery processes comprising: connectedness; hope and optimism about the future; identity; meaning in life; and empowerment (giving the acronym CHIME); and (c) recovery stage descriptions which mapped onto the transtheoretical model of change. Studies that focused on recovery for individuals of Black and minority ethnic (BME) origin showed a greater emphasis on spirituality and stigma and also identified two additional themes: culturally specific facilitating factors and collectivist notions of recovery. The conceptual framework is a theoretically defensible and robust synthesis of people's experiences of recovery in mental illness. This provides an empirical basis for future recovery-oriented research and practice. From maid to mother: transforming facilities, staff training, and caregiver dignity in an institutional facility for young children in Nepal. Training brain injury rehabilitation therapists to use generalized teaching and interaction skills.